Summer is winding down and the air begins to change as Fall comes around. Those nights that are perfect to sit and listen to the wind are here. Maybe it’s me or maybe it’s the universe but I can’t help but hear the wind whisper “papara pa pa eu eueo” over and over again. It echoes and follows you around everywhere you go, as if the universe itself has a musical soundtrack just for you. Music is a universe in and of itself that rather than keeping secrets, shares in notes, chords and lyrics that take us along on an adventure of sounds like no other. That “papara pa pa eu eueo” that you hear announces the return of Café Tacvba, one of the most unique, celebrated and respected groups in Latin Music. Why would the universe pick Cafeta you ask? 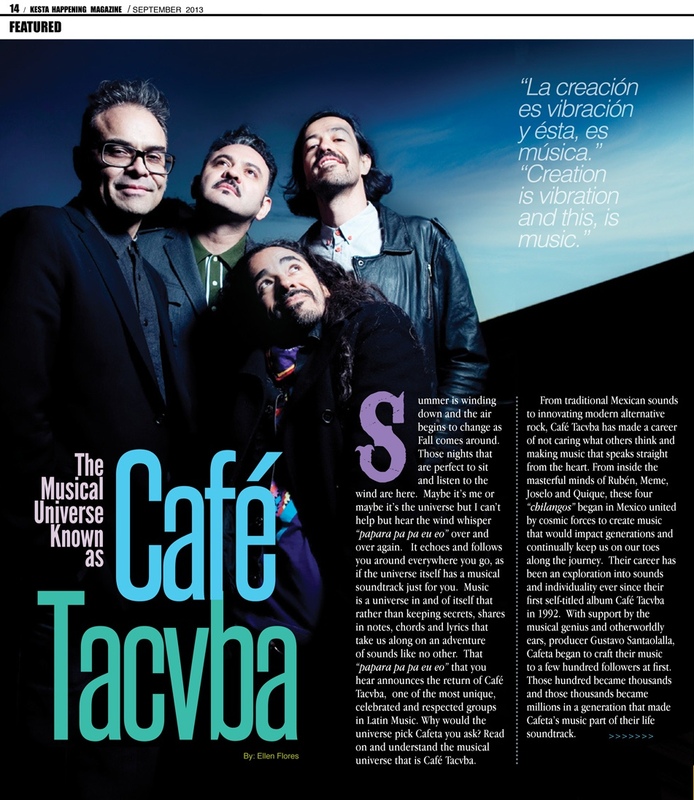 Read on and understand the musical universe that is Café Tacvba. From traditional Mexican sounds to innovating modern alternative rock, Café Tacvba has made a career of not caring what others think and making music that speaks straight from the heart. From inside the masterful minds of Rubén, Meme, Joselo and Quique, these four “chilangos” began in Mexico united by cosmic forces to create music that would impact generations and continually keep us on our toes along the journey. Their career has been an exploration into sounds and individuality ever since their first self-titled album Café Tacvba in 1992. With support by the musical genius and otherworldly ears, producer Gustavo Santaolalla, Cafeta began to craft their music to a few hundred followers at first. Those hundred became thousands and those thousands became millions in a generation that made Cafeta’s music part of their life soundtrack. Fast forward and you have anthems like “Ingrata”, “El Baile y el Salón”, “Eres”, “Mediodía”, and the untouchable Juan Luis Guerra classic “Ojalá Que Llueva Café” cover that the Tacvbos have made their own. This is what makes Cafeta’s music tried and true. They take something familiar, take it into the studio or infront of a live audience and spit it back at you in a way you’ve never experienced before. Cafeta’s latest release “El Objeto Antes Llamado Disco” (The Object Formerly Known as Album) takes us back to the days when you would listen to a recording from start to finish without skipping songs. In today’s single-release economy, do you remember what an actual album is? Cafeta wants you to remember and desire that feeling once more. In “El Objeto Antes Llamado Disco” Cafeta has taken the time to go back to the starting point to resurrect the art of making an album. “La creación es vibración y ésta, es música. a hacer música, todos juntos. EL OBJETO ANTES LLAMADO DISCO. “Creation is vibration and this, is music. “El Objeto Antes Llamado Disco” is Café Tacvba’s tribute to the craft of making music, being creative and being fearlessly unique. Recording El Objeto has been an evolution in the band’s way of doing things. The songs were performed and recorded in front of live audiences in México, Buenos Aires (Argentina), Santiago (Chile) and Los Angeles; something they had never done before. Songs like “Olita De Altamar”, “De Este Lado del Camino” and the new single “Aprovéchate” are portraits in the musical voyage through landscapes that excite the senses and connect us. Songs like “Zopilotes” are testament to the Cafeta style with haunting tones that enrapture the listener with the melodies and vulnerability in Rubén’s voice. Then you have songs like “Espuma” which take us to a zen place of tranquility and comfort all in a way that El Objeto does. Connection has always been an anchor in the life span of Café Tacvba. Their connection with each other and with their legions of fans is the glue that has kept them creating, composing and interpreting for over two decades. This fall will mark the first Café Tacvba tour in the United States in over five years. Washington DC will get their visit on September 17, at the Fillmore Silver Spring when we will embark with Café Tacvba on a musical voyage through sights and sounds that will excite our senses and connect to our souls in a way that only Cafe Tacvba can. Get your tickets early, this show is sure to sell-out! Visit http://www.fillmoresilverspring.com for tickets and information.